We wanted to bring something completely different to the Chemistry assembly line. Our new process for building a board that is both lighter, stronger, and has a better flex starts at its core. The “Flextronic” has a composite based poly vinyl stringer sandwiched between the lightest polyurethane foam on the market. These blanks come in two different (1/4″, & 3/16″) flexes depending on surfer’s ability, weight, and flex preference. 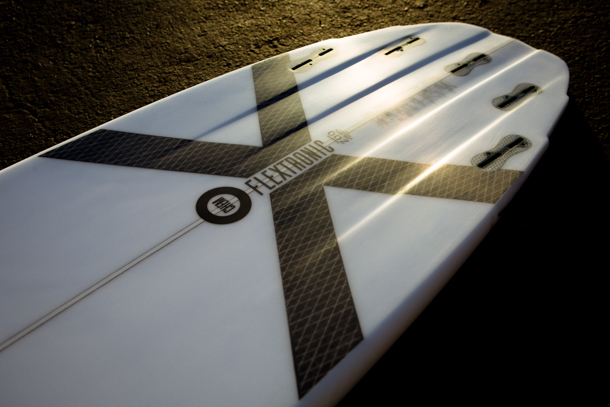 The poly based vinyl stringer retains its memory throughout the life of the board unlike its wood counterpart where the boards can lose their “pop” over time. Glassed with an epoxy resin, we find this combination with the poly blank to work seamlessly together. The X marks the sweet spot on the bottom, where energy is being transferred rail to rail with the help of the inner cloth. This is hands down the best tech you can get on any of our models in the Chemistry line. Like all new introductions to Chemistry, this tech went through rigorous r&d before being available to YOU. Order your next board with our new tech only available at Chemistry.